War History Online Presents this Guest Article By Author and Blogger Hans Wiesman – Check Out His Website! In this Dakota Hunter Blog post, you’ll see a stunning Video that shows all details of a combat mission with the lethal AC-47 T Fantasma. In the recent TV broadcast dated 16 February 2016, you’ll see the aircraft flying and operating as a hunter/ killer. This plane is the final version of what once started as a WW II built Douglas C-47/ Dakota Paratrooper/ Cargo plane, the Military version of the DC-3. But it was never designed to act in an Attack role! This video from the Colombian TV News Channel Caracol has just been released while tracking the “Bandits” with the Infra Red camera and eliminating them with the sideward firing Gatling type Machine gun that is installed on the cargo floor. The rotating 3 barrels are seen protruding from the fuselage windows while the rapid firing long barrel cannon (as seen in the lead photo) has been removed in the Video. Photo above shows the AC-47 T Fantasma (Spanish for Spooky) in all its glory. 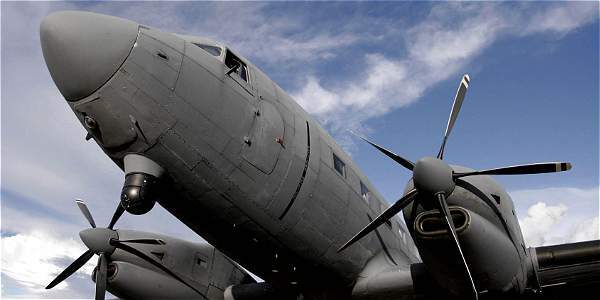 The Colombian Air Force (FAC) had 8 of those machines delivered via the USAF from Basler, Oshkosh WI, who did the conversion from the standard C-47 with Pratt & Whitney R-1830 Radial Piston engines to the Turbo Prop engines P &W Canada PT6A-67R’s with 5-blade reversing props. That conversion adds a substantial extra propulsion power to the aircraft. Therefore, the cargo hold/ fuselage could be strengthened and extended by an additional 60 inches, placed right behind the cockpit. The engine nacelles are extended for housing the Turbo Prop engines with the exhaust pipes on top and the cockpit nose sticks up much higher. The max payload is 43 % up, 24 % more speed, lower stall- and approach speed, while retaining its legendary big balloon tires. The plane, with its extra thrust, is more than ever capable of landing/ take-off from any short and unasphalted strip in the jungle, savanna or the mountains, which makes it the ideal gun platform for IR guided low altitude surprise attacks in a primitive Jungle environment. Note the FLIR ( forward-looking Infra-Red) camera under the nose, operated by a navigator/ controller. The pilots wear special helmets with Infra-Red Goggles mounted on their helmet screens which allow a perfect sighting of all targets below them that radiate heat. Human bodies, cars, trucks, generators, hidden laboratories, and living spaces become visible in day and night time, easily to be tracked for the next step. 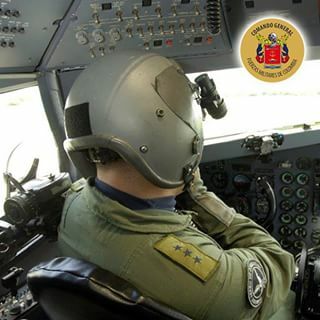 The photo above; This is “El Orgullo”, Spanish for the Pride of The Colombian Air Force, as seen in the Video below. Most efficient in this jungle setting and very cost effective, using basically a revamped airframe of a 70 + years old WWII Veteran Cargo Plane that may have flown over the European war theatre in 1944 and that is no joke! As you can see, there surely is some hefty Hi-Tech equipment on board in Avionics, Infra Red nose camera, and coupled fire guidance sights. But overall, the operational and purchase costs of this Hunter /Killer system is only a fraction of what can be spent with Ultra High Tech airborne hunting systems with UAV’s (Raptor etc) and F-16’s. Admittedly, the circumstances are of a different order than the Middle East with a much smaller scale of hostilities but it is quite safe to say that in the downfall of the FARC (Colombian Communist Guerilla Force and the Continent’s supreme Drugs Dealer) this Old Soldier with its modern weapons had had a lion’s share. FARC brought Colombia on the verge of a total collapse in a (near) Civil War that lasted for over 50 years. You should read my book The Dakota Hunter, and see what I experienced there when I came back in October 2006 with the War on Drugs running into a full escalation. The US Government had stepped in to help the Colombians against yet another leftist Guerilla Gang. But this was different from what happened in Nicaragua and El Salvador. FARC had become a self-supplying terror corporation due to the monopolising of the Colombian Drugs scene, plantations, and trading. With all “Old School” Drugs Lords of the type Pablo Escobar being killed or extradited to the USA, the FARC jumped into the vacuum and took over that money printing machine since the late 1990’s. I encountered an overwhelming Military presence in daily life with roadblocks everywhere and saw it as a national paranoia but is was actually the start of the great showdown between FARC & FRIENDS (Venezuela’s President Chavez and the Comrade from Moscow) against a very determined Colombian President Uribe with Military/ Intelligence/ DEA support from the US Government. I describe in details my insane voyage to the war-ridden South of Colombia, to Villavicencio. It is the Capital of DC-3 in the world but at that time also a beehive of the illegal Drugs trade in which that DC-3 played a substantial role. The city was for years maybe not the hub from where the drugs were exported to Venezuela and Ecuador, but surely the airfield where their versatile cargo transports were maintained and fueled. There is simply no other airport in the whole South American continent better equipped for Dakota repairs and P&W radial engine overhauls than Villavicencio. 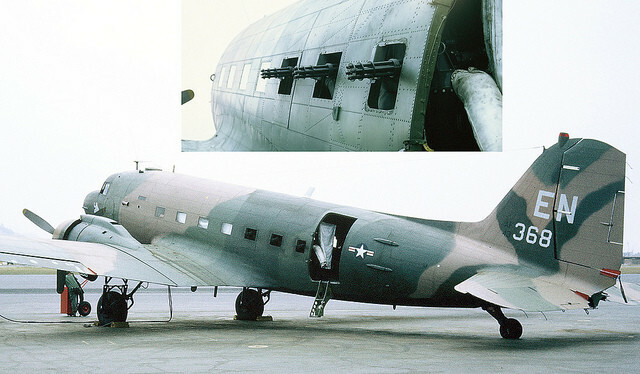 The photo above depicts the original setup of the first Vietnam War AC-47 Spooky Gunship (1964-1974), with three GE Gatling type mini-guns mounted on the cargo deck. There was no Infra Red camera yet, but the Close Air Support of those 7.62 mm caliber perforators was very much appreciated by the ground troops that often were being attacked/ ambushed from paddy fields, hamlets, jungles. The overhead flying shotgun-like fire support was much feared by the Viet Cong soldiers. Here follows an episode taken from my book The Dakota Hunter; “Arriving at Bogota International Airport in October 2006, an American DEA agent tried hard to send me back on the same aircraft that brought me in from Paris. “Sir, this is no holiday resort here, this is the Wild West, there is a War on Drugs going on here, you understand me? You better stay out and get back, there are no Extranjeros out here !” I deemed it all exaggerated and ignored all signs of an imminent Kidnapping in my frantic efforts to meet the Dakota, the aircraft for which I have a lifetime passion. How that war was won, or at least, how FARC was defeated, you can read it in my harrowing reports, illustrated with dozens of photos from the multiple Colombian trips that I made during that War on Drugs. My book has 320 pages with the Colombian chapters and 10 more identical stories that I experienced in 20 years “in search of the Legendary DC-3, at the last frontiers”, fully illustrated with 250 photos. You´ll be stunned to read that a 70-year-old aircraft can still evoke such hefty hassles and a “harrowing of Hell”. In the book The Dakota Hunter, you will read most intriguing and engagingly written stories about the last and lost Dakotas but alsoCatalinas, Connie’s, Curtiss Commandos and DC -4/6/7’s of this world, crashed, abandoned or still flying. Come follow me to Alaska, the Caribbean, Venezuela, Honduras, Brazil, Madagascar, Africa, Thailand, Venezuela, The Yukon, Bolivia and Colombia, into the heart of theAmazon region where I still found the Dakota operational in flocks. My book can be ordered straight away, only a mouse click away if you go to this Amazon link for ordering and reading 5-Star reviews of my book. Or if you like, go to my webshop where you can order my book in signed version or see my Publisher Casemate site at The Dakota Hunter book content/ ordering. Last week I received this video from a Colombian TV Network. It is a 4 minutes film in the Spanish language with no subtitling, but the images speak for themselves. You get a perfect insight of most of the Electronic equipment that deals with the Infra Red camera onboard and the coupled tracking system. On top, you’ll see the 3-barrel Machine Gun shooting in an amazing rapid firing mode. The flight of the Fantasma in the Colombian sky is a must to be seen. Very rare footage indeed, only now made available for a TV report on its role to fight FARC and other Drug Dealers has no more secrets. For more info, a sneak preview, reviews and chapters of the book, come to my website dc3dakotahunter.com, where you can also read all my previous blog posts. Certification is issued by myself, being owner of the Donor C-47 aircraft. If you have any remarks, suggestions, questions or interest in this unique offer of the Commemorative Plaque and photo (as shown below) please send me an email by pressing the contact button in the upper right corner of my Home page on my website dc3dakotahunter.com Are you interested in a special Collector’s Item? 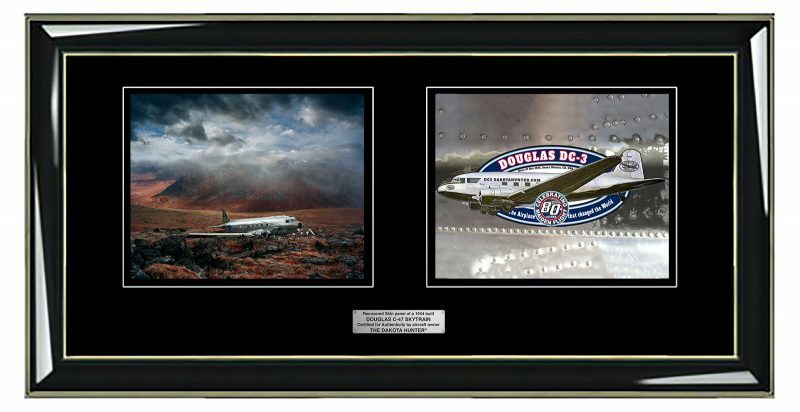 Soon, I will offer for sale an authentic piece of a recovered C-47 Fuselage decorated with theDC-3 80 years logo and a stunning picture of the legendary DC-3. The picture below depicts the Commemorative Plaque plus Photo. Along with a Certificate of Authenticity and the small text plate, you can soon order this strictly Limited Series.